“Every 25 seconds in the United States, someone is arrested for the simple act of possessing drugs for their personal use… ” This fact is stated by the ACLU in a collaborative report with Human Rights Watch. With these kinds of statistics, it is no wonder our prisons are filled by people with non-violent drug charges. These non-violent offenses can have a major impact on the lives of the people who committed them. Crimes, ranging from misdemeanor to class A felony, can make these already vulnerable people even more vulnerable to human trafficking. In this post, I will give a brief history of the War on Drugs, examine the statistics revolving around the War on Drugs and the realities that these drug offenders face while in and after being released from prison. Coffee Consumption Consciousness: Where does your coffee come from? Here at The Ohio State University, we loveee coffee. But what are the effects of this infatuation? Upon beginning the investigation into where our coffee at OSU is sourced from, the first problem we encountered was the lack of transparency by Hubbard and Cravens. A stark contrast to Crimson Cup, whose website has an entire section on their Friend2Farmer initiative, a direct trade program that goes a step beyond the ideas for Fair Trade. Within their Friend2Farmer program, they are committed to becoming involved in the coffee-growing communities to cultivate a better standard of living for the people within them. The Ohio State University states on its website that they have a commitment to becoming 100% direct trade. The Assistant Director of Dining Services stated that this is why they gave Hubbard and Cravens the deal to be on campus instead of Starbucks two years ago. If it is their goal to become 100% direct trade, this is comforting. But they also state their wish to become 100% transparent about food sourcing, which Hubbard and Cravens is not. 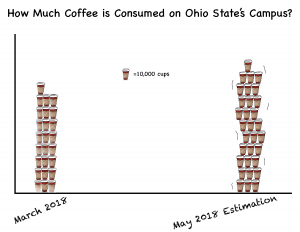 Dining services is primed to sell about 305,000 cups of coffee in spring semester alone through the two on-campus coffee suppliers Crimson Cup and Hubbard and Cravens. 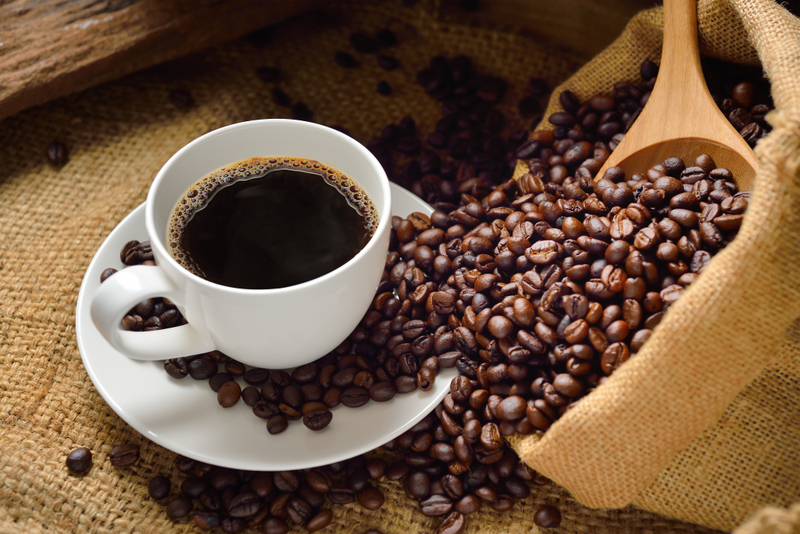 A cup of coffee can average around $2.25, which is about $686,250 per semester, for drip coffee and Americano coffee alone. This figure does not include lattes or other specialty drinks. With this, it bears mentioning that on average, 41% of American Adults drink coffee daily, with 60% of the population drinking on occasion. Additionally, around 78% of college students drink coffee daily. Field to Cup – How do we get our coffee? Supply chains can be very intricate, and coffee is no exception. Coffee is an industry where monitoring a company’s manufacturing process can become incredibly obscured since there are several steps in the production of coffee. According to Brown Political Review, “The production of coffee generally contains seven levels – growing, harvesting, hulling, drying and packing, bulking, blending, and roasting – in addition to intermediaries, including transporters, exporters, and retailers.” This obscurity can contribute to the sidestepping of labor laws and ethical work conditions in certain countries. On the Hubbard and Cravens’ website, it is stated that their coffee is sourced from El Salvador, Colombia, Honduras, and Guatemala. There are seventeen countries identified by U.S. Department of Labor as culprits of using child labor. These countries are Colombia, Costa Rica, the Dominican Republic, Guatemala, Guinea, Honduras, El Salvador, Kenya, Mexico, Nicaragua, Panama, Sierra Leone, Tanzania, Uganda, and Vietnam. In Côte d’Ivoire, both forced and child labor are used. In the Trafficking in Persons (TIP) Report, Columbia is listed as a Tier 1 country ( a country which meets the minimum standards of the Trafficking Victims Protection Act (TVPA)) while Côte d’Ivoire, Dominican Republic, El Salvador, Guatemala, Honduras, Kenya, Mexico, Nicaragua, Panama, Sierra Leone, Togo, Uganda, and Vietnam are all Tier 2 countries (Do not meet TVPA requirements but are striving to do so). Costa Rica, Guinea, and Tanzania are cited as Tier 2 Watch List Counties (are striving to meet TVPA requirements but there is a great danger for citizens in said country). Additionally, in the TIP Report from 2016 coffee is produced by forced or child labor in Côte d’Ivoire, Mexico, and Togo. However, Verité has uncovered indications of forced labor in the coffee supply chains in Guatemala. 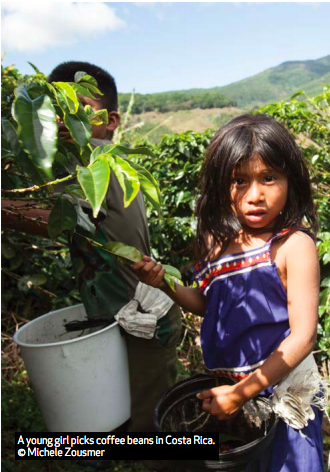 It was found that in Honduras 40% of the coffee that is harvested is done so by children. When prices are high children must leave school to harvest, and when they’re low they must leave school because their families cannot afford to send them. Additionally, in Guatemala, harvesters are not paid minimum wage and are denied the basic employee benefits that are required by law. On coffee plantations, the owners are able to impart forced labor by keeping workers in constant debt, an exploitive move that resembles the sharecropping that was legal after emancipation. The owners of the land make sure that if the workers have constant debt then they have to work for free until the debt is paid off. This leads to workers being in permanent forced labor. What does this mean for our coffee? Well, for Crimson Cup, this idea is clear in their Friend2Farmer Program. However, Hubbard and Cravens lacks this transparency, and unlike Crimson Cup, does not proudly display the Fair Trade seal on its website. This concerns us because though we know that OSU is committed to becoming 100% direct trade, does this mean that their direct trade is also Fair Trade? Fair Trade means purchasing “products from farmers in developing countries on terms that are relatively more favorable than commercial terms and marketing them in developed countries at an ethical premium.” Fair Trade certification requires evaluation by independent auditors to ensure requirements are met. The well-being of the individuals growing and processing products and their surrounding environment are the main focus. Once in compliance with the standards companies can sell their products with the Fair Trade Certified™ seal. The premium earned with this label goes to the producers and workers in that supply chain. Companies have to meet rigorous requirements to ensure that their products can be sold under this label. The Agricultural Production Standard (APS) sets the standards for Fair Trade USA Certified™ agricultural production globally. APS compliance criteria is grouped as : • Empowerment • Fundamental Rights at Work • Wages, Working Conditions and Access to Services • Biodiversity, Ecosystem Function, and Sustainable Production • Traceability and Transparency • Internal Management System. Add us on social media for updates and news! You CAN urge Ohio State to be more transparent in their supply chain! We just want to make sure that this institution is getting coffee from ethical sources! Written in conjunction with Ana Hoosier, Rachael Herman, Lucky Sandhu, and Harrison Lejeune. Since the late 1970’s, the government of the Republic of the Union of Myanmar (Burma) has enforced discriminatory policies on a multitude of minority ethnic groups, the most known of which are the Rohingya Muslims. These policies include denial of full citizenship to Rohingya Muslims, extortion and/or arbitrary taxation, seizure of land, forced eviction and demolition of homes, extreme limitations on movement within the Rakhine State and elsewhere via necessary movement permits, and legal/ financial restrictions on marriage. Rohingya Muslims were and still are forced to work on infrastructure and in military camps for little or no pay in Myanmar. There are several instances of mass migration of the Rohingya to Bangladesh, then their repatriation. It is a cycle that leaves these desperate people vulnerable to several forms of human trafficking, primarily young Rohingya women and girls (however, there are several documented cases of labor traffickers targeting Rohingya men). Within this blog post, I will further explore the background/causation of the mass migration of the Rohingya into Bangladesh, and the trafficking that occurs within the camps and the region.